Are these the guts of the new teardrop shaped iMacs? The iPad mini is getting all the hype this month, but we haven’t heard much about the line of new iMacs that should be coming out some month soon. Apple hasn’t updated the iMac lineup in over 531 days, but according to a new rumor, a redesigned iMac might be unveiled at the iPad mini event on October 23rd. 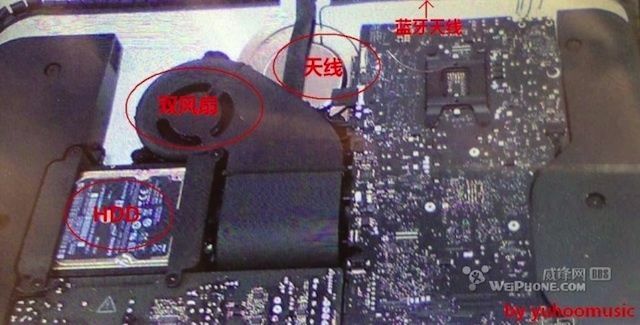 A new photo of what is claimed to be the internals of the new iMacs was posted on a forum thread for the Chinese site WeiPhone. The post claims that the photo is of the new logic board and internal components of an iMac that will support a newly designed body. The new iMacs are rumored to be thinner than the current model while also sporting a new curved, teardrop shaped outer shell, and that they will be announced when the iPad mini is announced in October. One way that Apple might make the new iMacs thinner is by ditching the optical drive just like they have with the MacBook Air line and the new MacBook Pro with Retina display. They may also use new display manufacturing methods that are used with the MacBook Pro with Retina display where the display and front glass are on piece rather than two separate pieces, which would save a few millimeters of internal space for the thinner design. No information was given as to whether the new iMacs will come with a Retina display. If they are announced at the October 23rd keynote, we believe Apple will have near immediate availability for the new machines.